This really isn’t a dessert cake, but rather a cake to serve at tea time or for an early morning treat. It’s filling but not heavy. I made it Tuesday night because I was expecting friends the following morning. On Wednesday morning, I prepared hot water for tea and coffee, had juices and water ready in the fridge, and bought a variety of sandwiches made with ciabatta bread and croissants from Mr. Baker which I had cut into three pieces each. I would have prepared sandwiches myself but was up the night before trying to whip the house into shape. Between making the cake and letting it cool down, thoroughly cleaning the entire first floor which my children had trashed that day and then a shower afterwards – I was up until 12AM and up again by 6AM to get my son fed and ready for school. Needless to say, I don’t think I was a great hostess. One of my friends brought a huge tray of homemade tiramisu which I put into the fridge and forgot about until after they left. I was playing a not so good game of ping pong between Spanish (one of my friends is Venezuelan but has lived in Italy for a long time and is married to an Italian) and Italian (other friend is from Rome). The two languages are so similar that it’s easy enough to mix them up when you’re fully awake, so just imagine what it’s like when you’ve had very little sleep. Add to the mix a very tired and cranky two year-old who did nothing but jump on the couch for the first half of the visit and whine the other half, and, well, I’m not sure if they’ll be back to my house anytime soon. 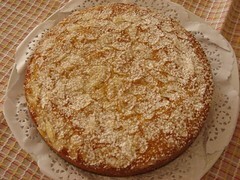 The cake was good though, and if an Italian woman says “È buono” and looks like she means it, then trust me, it’s good. Preheat the oven to 325C. Butter and flour an 8-inch spring form pan. Using a food processor, grind together the whole almonds and granulated sugar. Make sure you don’t overdo it by grinding it a little then pulsing into you get a finely ground mixture. Transfer to a bowl and then beat in the eggs, butter, milk, honey, vanilla and orange zest until smooth. Sift the flour, baking powder and salt over the egg mixture and stir/fold with rubber spatula just until the ingredients are combined. Transfer batter into prepared pan. 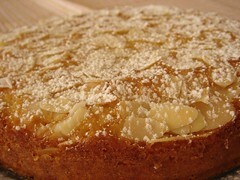 Scatter the sliced almonds on top. Bake until a toothpick inserted in the center comes out clean, 45 to 50 minutes. Wait a few minutes then run a knife around the edges and remove the spring form ring. Let cake cool and put a dusting of confectioners’ sugar over the top just before serving. *I love Sultan Center’s brand of sugar. It’s granulated sugar as it should be and not oversized crystals that would require a few spins in a food processor. Maybe here they back butter in an 8 ounce package or “stick”, but in the states 1 stick is 4 ounces. yara4ever – You’re right, it’s 4 ounces. I was thinking tablespoons. 1 stick butter = 8 tablespoons. The only vanilla extract I can find is that Foster Clarks stuff which is OK but not great. Im so happy i found ur blog again!! i lost the address when i deleted explorer! welcome back to my bookmarks! What do you think of Rachael Ray recipes? I’m not sure about them to be honest. I think she uses a lot of not-frugal ingredients and so her recipes come out quite pricey but I’m not sure. We can’t get ingredients like andouille sausage and smoked cumin over here so I will have to improvise anyway. I know a lot of people have mixed views about her but hey, she’s made her millions so she can’t be all bad! Wow!! My mom just adores watching ur channel. She just goes on and on abt it. I had no idea u guys were based in kuwait- where have I been??? ?